Wood Window Shutters Maintenance – Keeping your Shutters Out of the Landfill. If you have your original shutters, treat them as if they were gold. Just because they’re rotted does NOT mean they cannot be repaired. Use a high quality exterior wood filler for rotted wood (not bondo). Keep them painted. If the louvers are operable, be cautions of paint buildup. 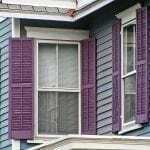 When you have your house painted, the painters will probably offer to replace your real shutters free of charge with fake vinyl shutters. This is easier for them than scraping, repairing, and painting the original ones. Don’t depend on painters or contractors to mount them properly – almost 100% are ignorant when it comes to this. The result is more harm than good. You are now the expert and must instruct them. 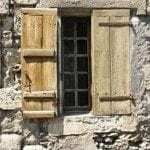 There are not many places that make shutters today and they’re very expensive; so, maintain your shutters, protect your investment, preserve history, and let your house shine with character. I also suggest attaching a copper or painted metal cap using an adhesive to the top of the shutters for water protection. “R” value for a glass window is about an R-1 rating. A piece of solid wood 1 1/8 inch thick is R-1.755. A closed wood shutter will therefore provide approximately R-2.78 of insulation. Add an interior storm window for additional insulation. After all you learned so far, a vinyl or aluminum shutter doesn’t even qualify as a shutter. However, we all need to be more conscious of our planet and our forests and the depletion of our natural resources. Remember (wood shutter owners), it is better to maintain and repair than replace. There are many new man-made products being invented to replace the use of wood. However, they must be indistinguishable from the product they replace at an arm’s distance. By far the most popular color for shutters throughout history is dark green – Benjamin Moore, Essex Green, Gloss to be exact. Secondary colors were black or a red color. Darker shades were favored to continue the visual concept of the window void when shutters are closed. Ok, you now know how a shutter should look on a house. You also know how important this is. With what you know, it is up to you to articulate what you want to the shutter salesperson. Remember, LET THE BUYER BEWARE. DO NOT assume that since you’re paying a lot of money, and buying from a recommended shutter manufacturer that specializes in Historic Buildings, you can be assured you will get Shutters and Hardware that will make your home look as it did 100 years ago. There are some good manufacturers out there that produce historically accurate shutters and hardware. You still need to order the right products to get the look you want. Use the wrong hardware to hang them and you just wasted your money. Your house does NOT have to be historic. If your house was just built, the same rules above apply – it’s all about making your house look the best it can. Remember, mounting shutters to the side of the window frame is wrong. For buildings constructed prior to the Civil War when Strap Hinges were used, some of the casing may be visible due to the Pintle being mounted more centered on the face of the casing. 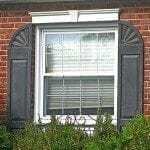 People are accustomed to seeing improperly hung shutters. They are accustomed to seeing the trim around the window not being covered up by a shutter. Manufacturers are catering to this demand of the public and are offering them what they want. Don’t worry! You CAN still get the look you want by being an educated customer. Shop around for shutters. Check their websites and get their brochures. Look at their sample photos. Do they look like original shutters or fake? Your eyes are educated now. Sadly, many of the sample photos in brochures I have seen look fake due to the type of hinges used. Don’t let this stop you, they should still carry the hinges you need. Next, read every page of the sites I list below. Compare the dimensions, rail height, type of wood, and all the types of hardware available on each site. 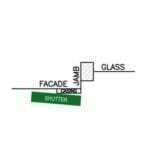 Next, print out one of the shutter measurement guides and hardware worksheets available on the manufacturer’s websites. Physically examine your window frame on the exterior and plot the dimensions. What shutter style you want. If it will be a working shutter, additional specifications and options such as rabbeted edge, and working louvers, faux or working tilt rods, etc. The appearance you want – how you want the shutter hung. They will then advise you on hardware to get that look. You will need a diagram/worksheet while discussing this. Once you receive your new shutters, install one as a test. If you are not happy with how it looks or operates, you will need to exchange the hardware. I hope this information has helped you. The purpose of this site is to educate you and guide you in making a purchase that will make your home look as authentic as possible. Please let me know if you think anything should be added or may need a better explanation. You rock! I have learned so much from reading your posts. I am buying hey home from 1925. So excited to put all this new information to use. Thanks!